I come for a leopard-deprived nation. Deprived not because of dearth of the spotted cats in India but because of the elusiveness of this cat due of the presence of tigers, which keep the leopards at bay. This reason was lucrative enough to take me to the pearl of the ocean to satiate this ever-growing hunger for leopards. The statistics, facts and data were quite interesting and encouraging. My Sri Lankan naturalist friend – Mevan Piyasena has played a pivotal role in my Sri Lankan journey. Mevan informed me that the Sri Lankan leopard (Panthera pardus kotiya) was endemic to Sri Lanka with its characteristic rusty yellow coat, dark spots and close-set rosettes (smaller than Indian leopards). The size was bigger in comparison to leopards of India and the leopard infact ruled this land being the top predator of Lankan forests. ‘Kotiya’ as they called the leopard in Sinhalese actually means tiger. “But for us this is the tiger of our land!” remarked Mevan. As I started my leopard expedition in the company of Mevan who was to be my friend philosopher and guide for tracing this beautiful cat, those reports of Yala recording the highest density of leopard population in the world were flashing in front of me. But reports can backfire when you are on the field so I was wondering whether all the data and stats can actually translate to leopard sightings during the coming days. Engulfed in these thoughts, I noticed a commotion of vehicles on road and before I could even question the driver, he pointed in the far left direction to disclose the location of my first leopard in Yala National Park. A young male was basking under the tree unwary of the crowd of vehicles trying to get a glimpse of his shining coat. I parked my vehicle and a patient wait for the next few hours enabled me to closely observe the behavior of this elusive cat. Slowly the vehicles along with the light started dwindling and I positioned my camera in anticipation of some action. The action was more than what I could dream of as the young male got distracted with some movement in front of me. He cautiously advanced towards his target and within a fraction of a second the cat and mouse chase started. My initial reaction was that the leopard was targeting the cheetal (spotted deer) herd near the water body. However a closer look through the camera revealed that a mongoose was in the firing line. A leopard on a hunt in an open field land was something I had never expected but the plethora of online facts and information were turning out to be true within no time. Little is known about the origin of leopards in the Indian subcontinent but it is believed that they may have come from the North-West passes and would have spread across the subcontinent plains (S.H. Prater 1965). Earlier it was believed that this was the only leopard specie that migrated to Sri Lanka and was isolated from India since Sri Lanka split off from the Indian sub-continent. An obvious brain-teaser : If the leopard is the top predator of Lanka, what does the Lion in Sri Lankan culture symbolize? Here are some of the theories : The sea level rise that separated Sri Lanka apparently gave birth to a new sub-specie of lion (Panthera Leo Sinhaleys Deraniyagala). Probably this is the reason why the Lion plays a significant role in Sri Lankan legend and folk stories. A contrary belief is that the Sinhalese (people of the lion) have origins in North-West India where the last symbol of Asiatic Lion (Panthera Leo) still prevails and this may be the reason for Sri Lanka’s fascination with Lions. Fossil records and studied have also indicated the presence of Lions and even tigers (Panthera Tigris) in the country. These large cats may have become extinct before the existence of mankind in the region. Recent genetic research on Sri Lankan leopards state that these leopards distinct species of mainline leopards and being the prime predators at the apex of the food chain, they determine the health of Sri Lankan green gold. 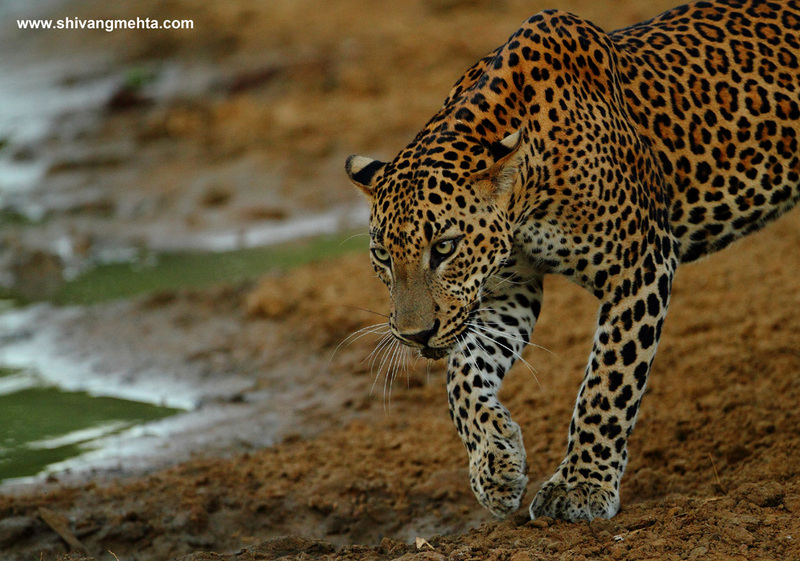 According to IUCN studies, the leopard density in Yala (as a case) for estimated at 17.9 per 100 square kms in 2001-2002. This data was enough to prove that the population of leopards in this belt was highest compared to any other protected or non protected area in the world. 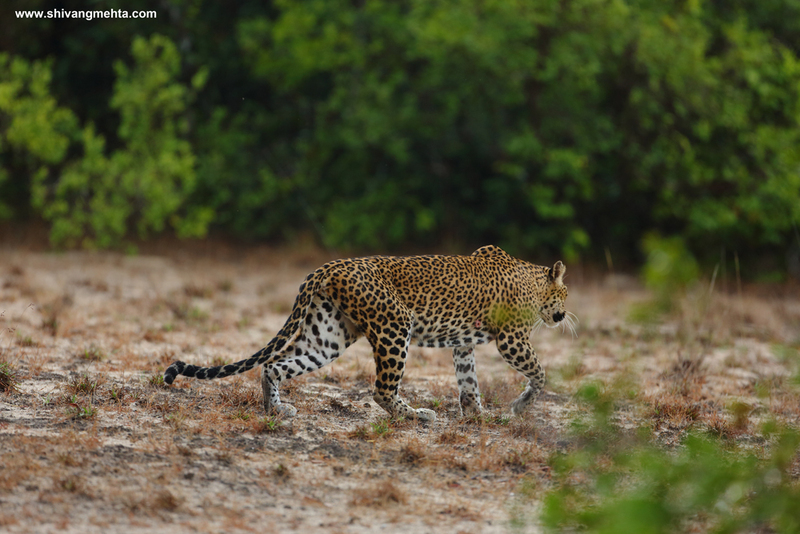 3 decade backs, Wilpattu National Park (180kms towards the north of Colombo) was known for having the highest densities of leopards in the world. Known as the Land of Lakes because of the presence of more than 60 natural water bodies, Wilpattu with its unique habitat was severely effected due to the war and as a result tourism in the park was shut down for nearly 3 decades. When the park opened up for tourism in 2003/04, wildlife enthusiasts were expecting to be stormed by leopard sightings but the first few years went pretty dry from a leopard perspective. The situation started to improve slowly and currently Wipattu is slowly trying to re-establish itself as the prime Sri Lankan leopard forest. So what is so special about Wilpattu as a leopard country? While Yala is all about those rocky terrains, Wilpattu is dramatically different. While traversing through the deep corners of this forest you will come across patches of open grasslands, huge waterbodies, thick shrubs and some beautifully located forest bungalows (where you can opt for a night stay as well). Once upon a time, Wilpattu was submerged under sea and this is the reason why you find patches of Wilpattu covered with white sand. Some areas of the forest resemble a white sand desert and probably no where in the world there is a probability of coming across a leopard on white sand tracks! 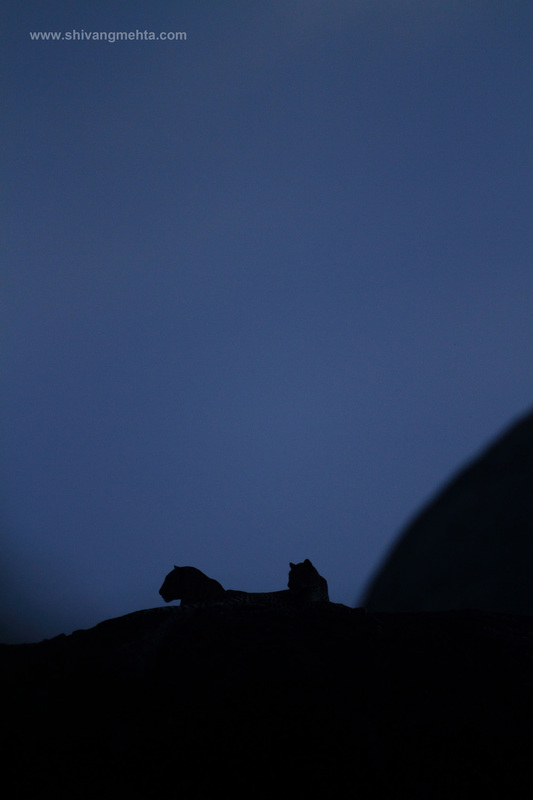 So if you are looking for a leopard is a unique never seen before backdrop, Wilpattu is the place to explore! The conservation issues surrounding Sri Lankan leopards are in sync with their cat counterparts across the globe. Human interference and impact has resulted in a significant decline in leopard population in the country. Game hunting during the colonial era, rampant poaching and lack of opportunities for conducting scientific studies on the magnificent creatures (due to decades of known political unrests) have hampered the existence of leopards. In addition, the rampant pressure of a 19 million plus and ever growing population has resulted in massive loss of habitat which is the key to survival of these cats. The Wilderness & Wildlife Conservation Trust of Sri Lanka estimates that since 2001 over 35 leopard skins have been seized. Human pressure is also correlated with the impact of tourism in Sri Lanka. Since the end of the civil war in May 2009, tourism in Sri Lanka has been rising rapidly. Though this is extremely beneficial for the local communities and economy, it is feared that the burgeoning tourist pressure may adversely impact the wildlife. The Sri Lankan Tourism Promotion Board Bureau reported an annual 27% rise in tourism with the numbers touching 83549 in Feb 2012. The visitor number is expected to touch 950,000 this year and the management of tourists inside forest like Yala National Park is matter of grave concern. The need for a balanced conservation strategy is imperative for issues like human pressure; conflict-management and poaching have been the main causes of decline in cat population across the Indian subcontinent. Historically elephants have been in the prime conservation radar for wildlife biologists and policy makers of the country and leopards have been ignored. 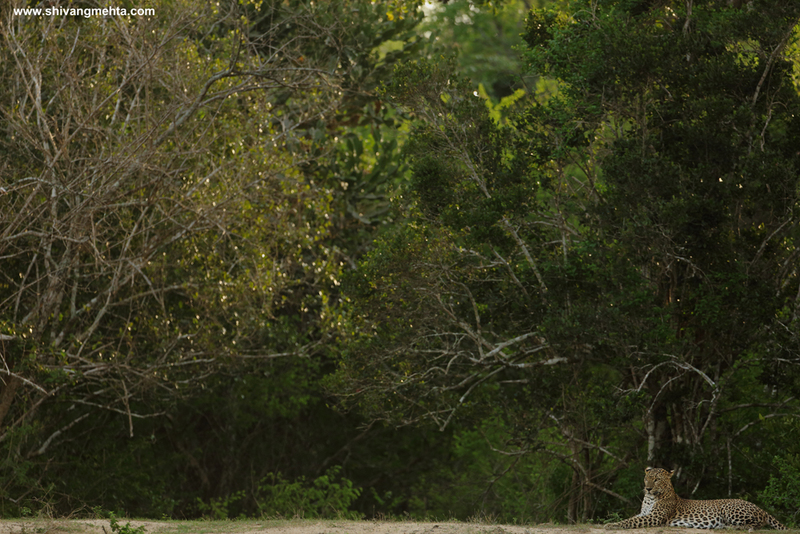 However with growing awareness levels around the importance of leopards in maintaining a balance in the Sri Lankan system, a number of Government bodies in association with local NGOs have taken the onus of saving the last few numbers of Sri Lankan leopards that are the flag-bearers of big cat population in this island country. 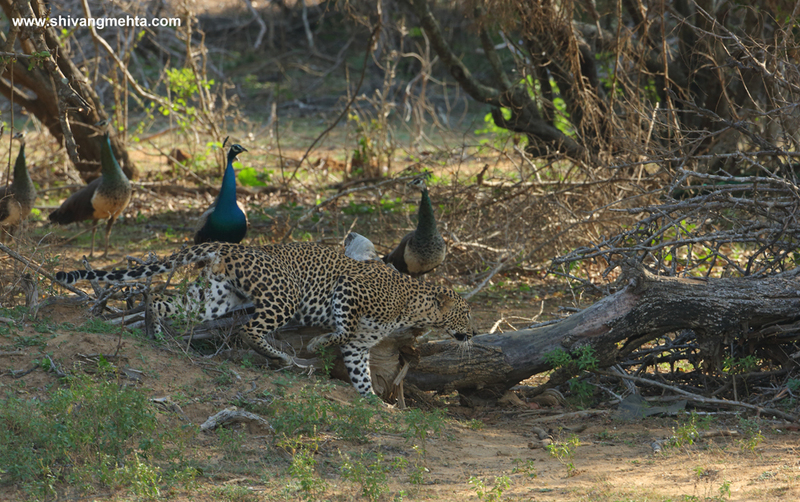 Coming back to my moment of glory in Yala… A Yala traveler had mentioned that leopard on a tree is just one of the beautiful leopard moments a photographer can encounter in this seaside wild paradise. Day after day this statement was becoming a reality for me as in my repetitive visits to Yala I have documented and witnessed some splendid dream leopard moments that I would cherish forever. My leopard wish-list is long and has been long pending as well. On the rocks… On the road… Mating… with cubs… and it goes on. With the thriving population of leopards in Yala, Mother Nature would surely bless me achieving some of these milestones in the near future. For sure the supreme cat is the Kotiya of this land! This entry was posted on April 29, 2013 by shivangmehtaphotography. It was filed under Wild Notes by Shivang Mehta and was tagged with Leopards of Sri Lanka, Sri Lanka, Wilpattu National Park, yala national park. Nice post and beautiful photos! !